Parents will go to any length to save their children, even face jail time. What wouldn’t you do to save your child’s life? For one Minnesota mom, that wasn’t even a question. Parents will go to any length to save their children, even facing jail time. Angela Brown’s story is a testament to what a mother’s bravery means, and what is wrong with the United States. In Madison, Minnesota, Angela Brown was raising a bright, athletic 11-year-old son when tragedy struck in the form of a baseball. A line drive straight to the skull caused bleeding in an area of Trey’s brain the size of a golfball. A stroke forced doctors to place him in a medically induced coma, and they feared he would not survive. When he finally woke up, he would never be the same. The traumatic brain injury left Trey suffering from seizures, migraines, muscle spasms, depression, and severe outbursts. Desperate to save their now 15-year-old son’s life, the family headed to Colorado in 2014 and obtained whole plant medical cannabis oil for her son. The oil contained both CBD and THC. With just a few drops, Trey’s pain melted away. Teachers were ecstatic about Trey’s improvement in class, able to focus and learn. They asked what had given him such a positive change. Angela told them the truth. A week later, the Sherriff’s Department seized the oil and charged her with endangerment of her child as well as contributing to the need for child protective services. The penalty for those offenses is up to 2 years in prison and a $6,000 fine. Without the oil, Trey’s seizures returned and he was sent to the emergency room twice, hefting an additional $8,000 of medical expenses on top of their legal fees. One charge was dropped in January of 2014, but the other remained. The family fought the case. During the course of her struggles, Angela became a focus of activist and media attention. 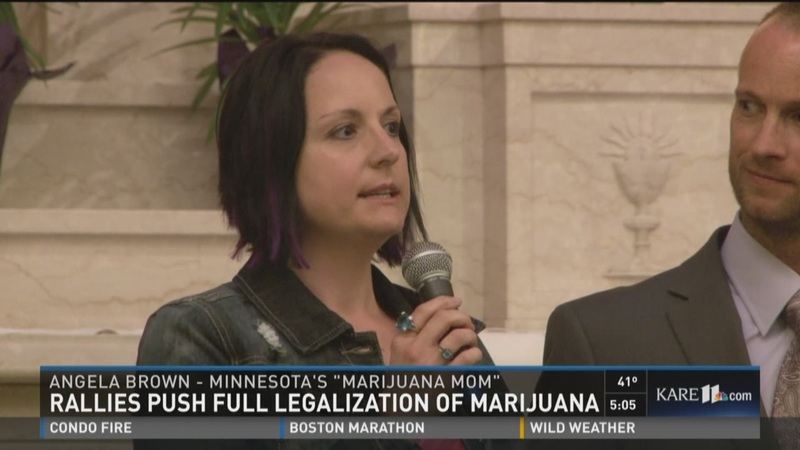 Her family’s story was featured in the movie “Pot”, and she has appeared on national television to share the tale. During the course of this ordeal, Minnesota became the 22nd state to approve medical marijuana, but the law would not take effect until July 1st, 2015, putting its protection out of the reach of the family as rising legal costs loomed over them. Faced with Trey being subpoenaed by prosecutors to testify against his own mother, and only a week before jury selection for the trial, a saving grace appeared. Angela’s lawyer worked out a deal with County Attorneys, and with a court fee of $100 and no law violations for 90 days, the remaining charge was dropped. The family had decided to move to Colorado, after the father, David, obtained a position with his former employer, the Corrections Corporation of America. Thankfully, Angela would be able to go with her 3 children, instead of to prison. That didn’t stop her from being tearfully upset about the whole ordeal. The tribulations the family has endured have given Angela a cause. She continues to help bring awareness to the truth about medical marijuana. She helps to promote the plight of patients, especially children, and their families, caught between the law and a healing herb. Do you think a parent should be charged with child endangerment for actually saving their child from suffering, or even dying? How can cannabis be considered endangerment when taking it away is what put the child back in the hospital? Voice your opinion on social media or in the comments below.